KENNEDY SPACE CENTER, FL – It’s March Madness for Space fans worldwide! A triple header of space spectaculars starts overnight with a SpaceX Falcon 9 launching in the wee hours of Tuesday, March 14 from the Florida Space Coast. Indeed a trio of launches is planned in the next week as launch competitor and arch rival United Launch Alliance (ULA) plans a duo of nighttime blastoffs from their Delta and Atlas rocket families – following closely on the heels of the SpaceX Falcon 9 launching a commercial telecommunications satellite. Of course it’s all dependent on everything happening like clockwork! And there is no guarantee of that given the unpredictable nature of the fast changing weather on the Florida Space Coast and unknown encounters with technical gremlins which have already plagued all 3 rockets this month. Each liftoff has already been postponed by several days this month. And the rocket launch order has swapped positions. 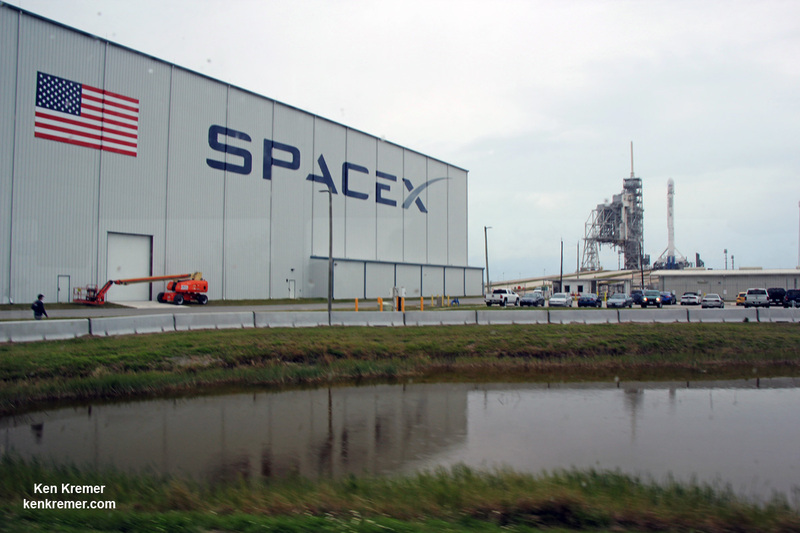 At any rate, SpaceX is now the first on tap after midnight tonight on Tuesday, March 14. The Delta IV and Atlas V will follow on March 17 and March 21 respectively – if all goes well. The potential for a grand slam also exists at the very end of the month. But let’s get through at least the first launch of Falcon first. Liftoff of the two stage SpaceX Falcon 9 carrying the EchoStar 23 telecommunications satellite is now slated for a post midnight spectacle next Tuesday, Mar. 14 from launch pad 39A on the Kennedy Space Center at the opening of the launch window at 1:34 a.m. EDT. You can watch the launch live on a SpaceX dedicated webcast starting about 20 minutes prior to the 1:34 a.m. liftoff time. The Falcon 9 rocket was raised erect into launch position by the time I visited the pad this afternoon, Monday March 13, to set up my cameras. The weather outlook is not great at this moment, with rain and thick clouds smothering the coastline and central Florida. SpaceX bilionaire CEO Elon Musk announced last week that he wants to launch a manned Moonshot from pad 39A by the end of next year using his triple barreled Falcon Heavy heavy lift rocket – derived from the Falcon 9. The second launch of the trio on tap is a United Launch Alliance Delta 4 rocket carrying the WGS-9 high speed military communications satellite for the U.S. Air Force. Liftoff of the ULA Delta is slated for March 17 from Space Launch Complex-37 at 7: 44 p.m. EDT. The S.S. John Glenn is scheduled to as the Orbital ATK Cygnus OA-7 spacecraft for NASA on a United Launch Alliance (ULA) Atlas V rocket launch no earlier than March 21 from Space launch Complex-41 (SLC-41) on Cape Canaveral Air Force Station, Florida.